Welcome to a very humid afternoon in Madison! Today's focus is on ways to add some sparkle and shine to a project. Now that I'm looking at it, you really cannot see the sparkle on this project thanks to my phenomenal photography skills. 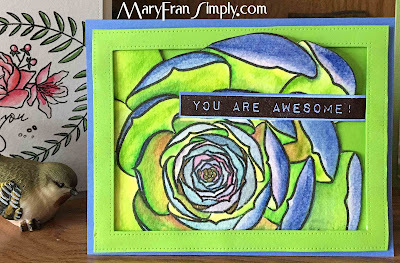 Just so you know I'm not making this up, I used the Spectrum Noir Sparkle Pen and painted all over this finished card and also used a Pen-Touch Gold pen by Sakura in the center and in select smaller areas in the succulent's tips. I began creating this A2 card by stamping this gorgeous stamp onto some Canson 140 lb. cold pressed watercolor paper with Versafine Black Onyx Ink. Once dry, I used my Zig Clean Color Markers in Yellow, Yellow-Green, May Green, and Green to do all of the large areas of these leaves and added water to push the ink around. I then used some Windsor & Newton Viridian Green, Aureolin Yellow, Ultramarine Blue, and Permanent Rose to color the smaller centers. I mixed some of the Rose and Ultramarine to paint the larger tips of the succulent. Once everything was dry I added the sparkle. 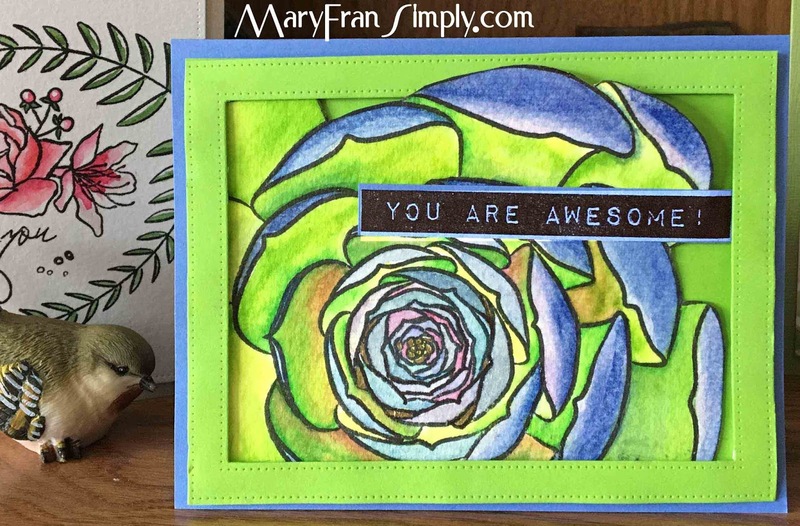 To assemble this card, I die cut a Stitched Frame from My Favorite Things in a green cardstock from Hobby Lobby that matched the greens in the succulent and popped it up with some fun foam that I also diecut. I adhered everything to a periwinkle cardbase (this cardstock also from Hobby Lobby) and stamped the sentiment from Altenew's Label Love - cut it out and tucked it behind the frame. Thank you very much for reading. This is truly a labor of love! The colors are so rich and beautiful! I am sure the shimmer looks so pretty in person! Thanks so much for entering your beautiful work in Altenew AECP assignment Gallery. Beautiful colors and design. Well done!